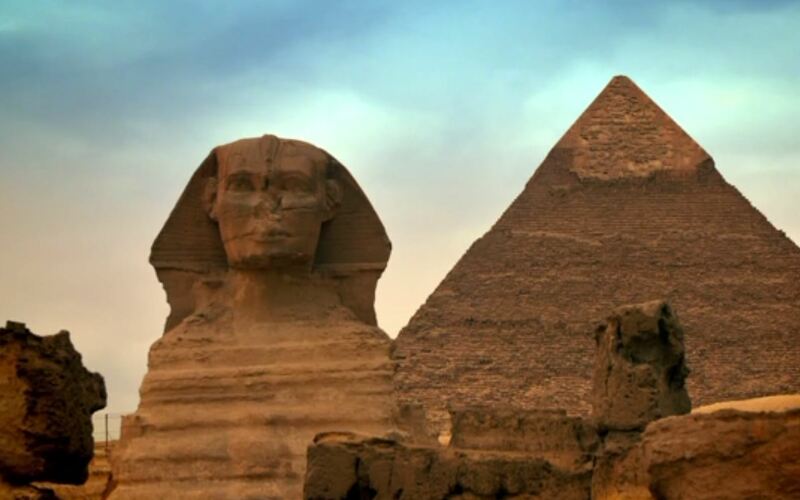 'Mythical Beasts' digs up origin of the sphinx on Science Channel – AiPT! How the sphinx went from revered to feared in under 2,000 years. Tonight the seventh episode of Mythical Beasts will attempt to unearth the origins of the larger than life legend known as the sphinx. The mention of the word sphinx tends to bring flashes of pyramids, statues, and sand, but make no mistake, the sphinx is a mythological creature that can be found in various cultures around the globe. The majority of this episode takes place in Egypt and Greece. Episode 7 opens in Giza at The Great Sphinx, and follows the work of Egyptologist Dr. Campbell Price and archaeologist Mostafa Al-Saghir. Though not much is actually known about The Great Sphinx of Egypt, it’s the largest and oldest colossal sculpture from ancient Egypt, at 66 ft. high, with 60-ft. clawed front legs. Price says the Egyptians saw artworks and sculptures as having magical powers and being alive in their own way, which implies that this massive sculpture is not a mere representation of the mythological sphinx as we see it today, it actually is the sphinx of lore. Price examines a carving that was done prior to the creation of the Sphinx, which shows the Pharaoh drawn in the image of a lion that’s mauling and striking fear into prisoners. He believes the pharaohs of ancient Egypt depicted themselves as lions because they symbolize power and strength, and incite terror across many cultures with their ferocity. Eventually the kings moved away from being illustrated as simple lions, to the human-lion hybrid. Ancient Egyptians worshiped a pantheon of gods who held powers that humans could never aspire to attain. They were typically depicted as having human bodies with the heads of animals best-suited to handle their specific roles. According to Mythical Beasts, the pharaohs merged themselves with lions in order to proclaim their divinity and command status. Sociologist Margee Kerr believes the reason the sphinx doesn’t follow the animal-head, human-body format is because humans have an advanced mind but our bodies are pretty inadequate when compared to an animal like the lion. It’s like taking the best from both the human and animal worlds. The Great Pyramid of Khafre is linked to The Great Sphinx, not just by proximity, but by their shadows, which align on the equinoxes. Khafre ruled Egypt around 2500 BCE and there is very little known about him, but it’s his head that most likely graces the top of the colossal lion body. Legend has it that 1,000 years after its construction, prince Thutmose IV fell asleep beneath The Sphinx of Giza and dreamt it spoke to him, asking to be unearthed from the sand. In return, the Sphinx promised Thutmose would become a king. He dug the sand bound Sphinx out and, mysteriously, Thutmose’s older brother died soon after and left him to inherit the throne. Thutmose’s dream brought The Great Sphinx back to the power of the throne, and a stele was erected between its paws, telling the tale. It became a place of pilgrimage and promise for those who would seek the throne, and its power of divinity dominated once more. The Great Sphinx is not the only sphinx in Egypt, though. There are literally thousands of them. Archaeologist Mostafa Al-Saghir and his team work to reset the 1,350 sphinxes along a spiritual walkway between Luxor and Karnak, and they’re finding even more as time goes on. Price believes the army of sphinxes line the boulevard to protect the living statue of the god Amun on his ritual trip to receive offerings from the pharaoh in Luxor. Unfortunately for the sphinx, this boulevard would also be where it would fall from power. Al-Saghir has found evidence of destruction that indicates the end of the Egyptian pharaohs and the pantheon of their human-animal hybrid gods. A block near the spiritual walkway is inscribed with the name Cleopatra, the last queen to rule Egypt before the Roman Empire took control. The block is upside down, indicating the stone was taken from its original building and reused. Across the boulevard in Karnak, Price admires the remains of a huge carving of Thutmose III. It’s been attacked and resculpted into the image of a crucifix. He says the sphinx didn’t die with the Roman Empire, it died with the rise of Christianity. As the sphinx died out in Egypt, it rose in Greece as a man-eating riddler with the head of a beautiful woman and eagle-like wings. Archeologist Anthi Dipla believes the gryphon, probably of central Asia, was the reason for the shift in image. A Gryphon has the body of a lion and the wings and head of an eagle. Mythical Beasts supposes that travelers from Egypt and central Asia met in Greece, supplanting each other’s mythical monster and forging a new one altogether. Dipla suggests the Grecian sphinx was viewed as a symbol of horror because she attacked young men in a very patriarchal society. The female sphinx supposedly terrorized the people of Thebes until a hero named Oedipus conquered her riddle and caused her to devour herself in humiliation. This episode is just a glimpse into the massive amount of sphinx-related legend across Egypt and Greece. It does a good job of sorting out as much information as possible and making disclaimers where there are breaks in the consensus. The disclaimers could be a bit more pronounced — there’s no shame in not knowing or reaching a total consensus –but it’s important to know when there isn’t a 100% agreement. The Sphinx episode of Mythical Beasts airs tonight at 10:00 eastern time on the Science Channel.